A block of flats which has been left teetering on the brink of collapse by floods this week is set to be demolished. 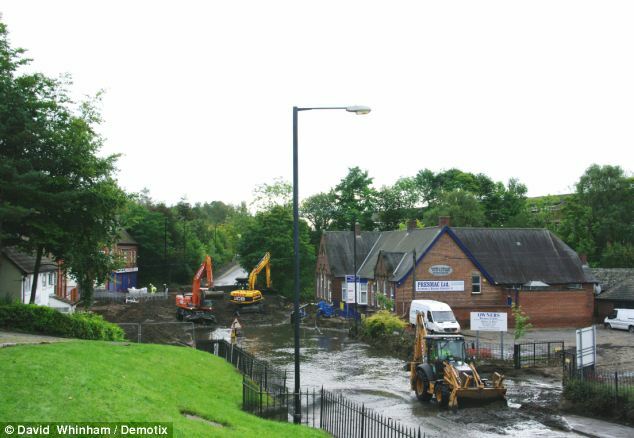 Spencer Court in Newburn, Tyne and Wear, was left with its foundations totally exposed after extreme rainfall ripped away the ground from underneath the building. 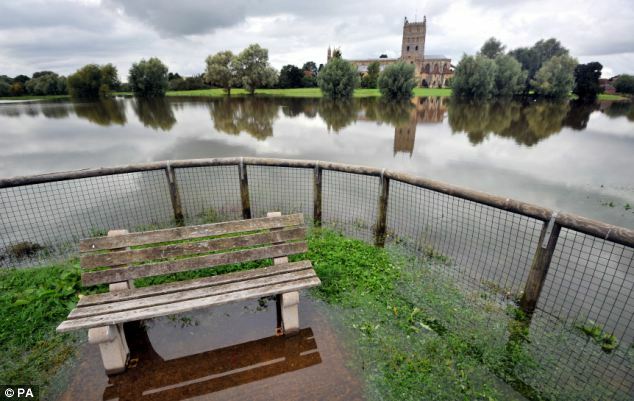 But the flooding misery is set to ease in most of Britain over the next few days - with sunshine expected in many areas for the rest of today and tomorrow. Residents of the stricken flats - who were previously been evacuated - were told last night that their homes would soon be lost as engineers confirmed that 'plans were being put in place' for the demolition of the block. 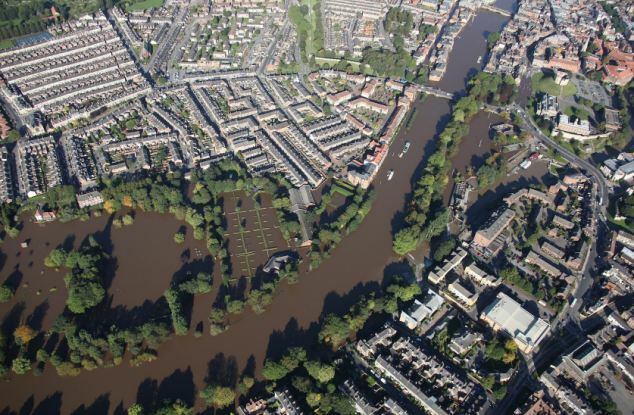 The revelation caused an outcry among home owners in Spencer Court and the surrounding blocks of flats who were evacuated as a result of the flooding earlier in the week. Some residents who had been allowed back into their homes on Wednesday were asked to leave again yesterday over fears for their safety. Leanne and Graham Bullock, who live in Mill Vale, adjacent to Spencer Court flats, said they are unsure of their future. 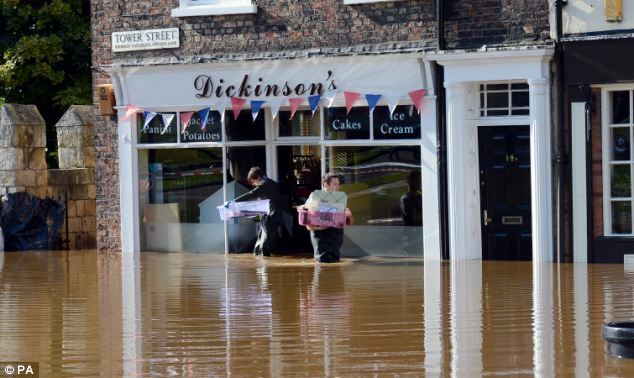 Northumberland Estates which represents the Duke of Northumberland's business interests and owns part of the land where the flooding has taken place, apologised for the problems on the site. The underground culvert which collapsed is in the section the company owns. 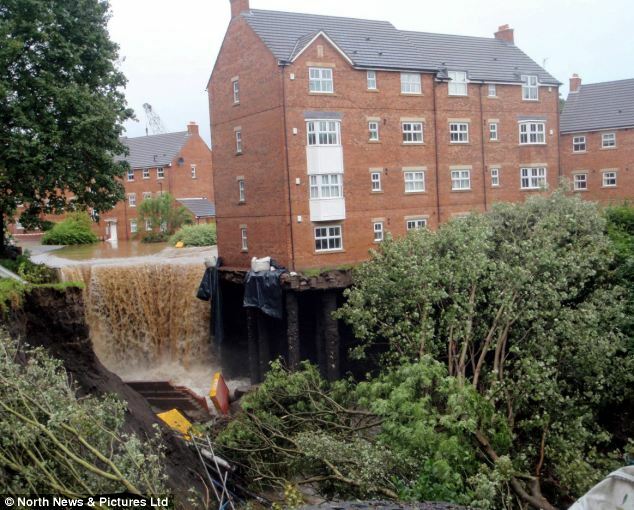 A spokesman said: 'We are desperately sorry for the residents of Spencer Court and Mill Vale that this has happened yet again. 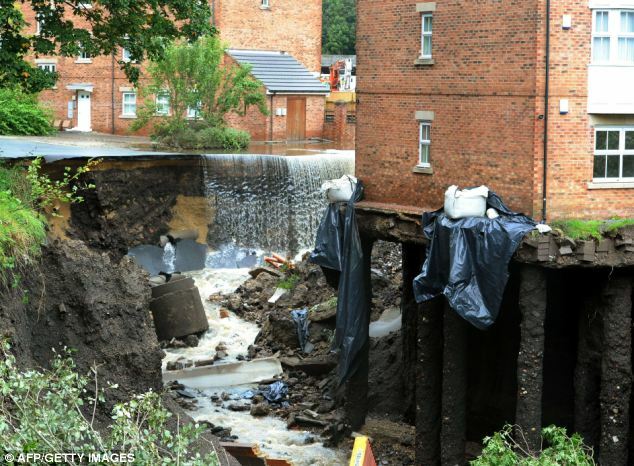 'Since the culvert collapse, we have been working very hard to resolve what is an extremely complex engineering problem, given that the culvert lies 12 metres below ground, and the land itself is proving to be highly unstable. Dunelm Homes, who also own some of the land, spoke to affected residents, but anger flared as many felt they were not being listened to. Mill Vale homeowner Elaine Boynton, who had been evacuated but since let back into her home, said: 'Nothing has been achieved and still nobody is admitting liability. No timescale was given on when the demolition of the block may take place. A Northumberland Estates spokesman said: 'We are working closely with the police and other services at the present time, in particular to enable residents to access their homes, where and when it is deemed safe. 'Unfortunately, the exceptional weather conditions experienced this summer, which have seen the North East subjected to two of the most exceptional storms on record, have caused many problems for the team. Water levels are finally receding in rivers swollen by the most intense September storm for 30 years. 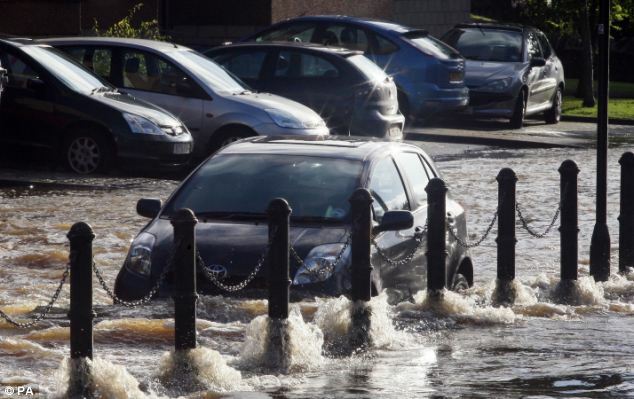 Heavy downpours in parts of the UK since Sunday have raised river levels and flooded hundreds of homes and businesses. A couple may have drowned trying to rescue their dog from a swollen river near Wrexham, north Wales. It is feared that the couple entered the river trying to rescue one of their dogs and drowned in fast currents caused by the heavy rainfall. Alicia Williams, 25, who has a young daughter, and boyfriend David Platt, also 25, were found dead on Wednesday by the River Clywedog, near Wrexham, north Wales, where they had been walking their dogs. Speaking about the couple who may died, Detective Chief Inspector Mark Pierce last night said: 'We believe the couple were here with dogs and at the time the river was swollen. 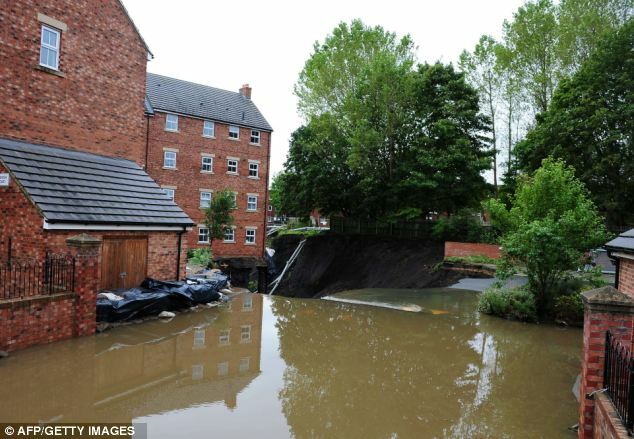 'The river level was at a higher level than it is at the moment. All of the couple's dogs were recovered safely. And an 11-year-old by struck by lightning outside his school in Swindon, Wiltshire, is in a stable condition in hospital. 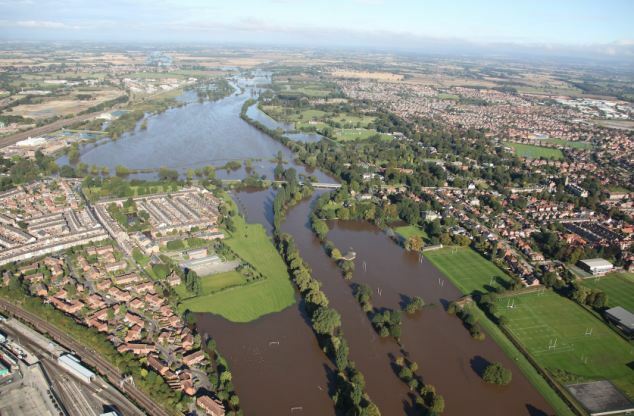 Around 570 properties have been flooded across England and Wales because of the storm, and railways and roads were swamped by high water levels. 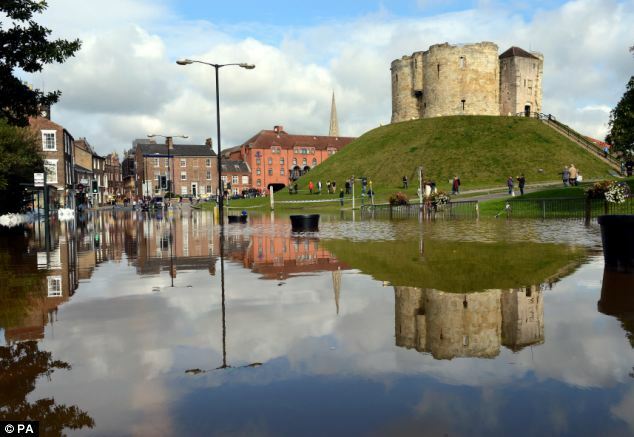 River levels remain high in the areas worst hit by the bad weather, including in York where around 100 properties are flooded and the Ouse has reached a peak of more than five metres above normal - the second highest level recorded. 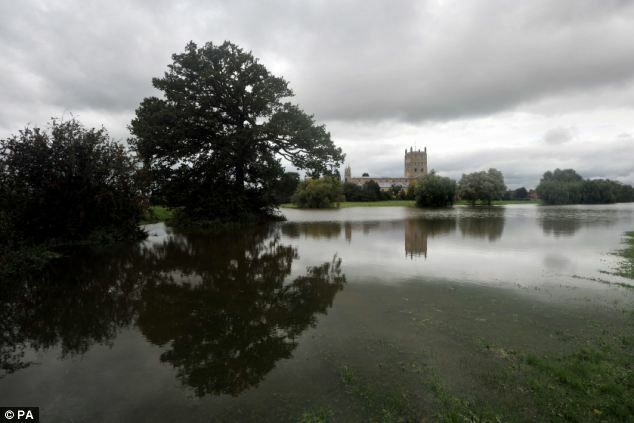 But the Environment Agency [EA] said many river levels have now peaked and are expected to fall throughout the morning. 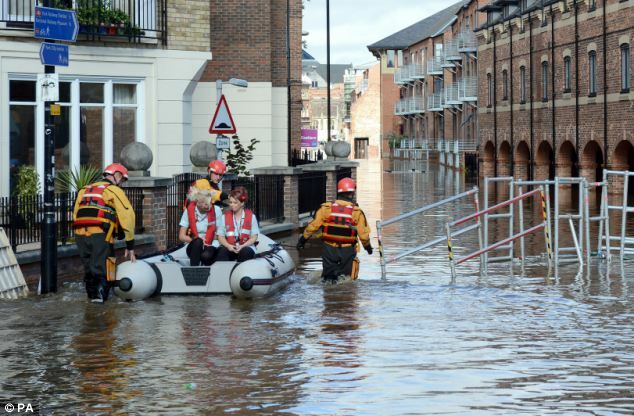 The EA said there were 27 flood warnings and 34 flood alerts in place, mostly across the North East. The Met Office said the most intense September storm since 1981 is the result of the unusual position of the jet stream: a high-altitude band of wind which steers weather systems. It caused heavy rain and floods in the summer when it shifted further south than normal. The Met Office expects the outlook to improve in the coming days, with weather returning to the mixed picture of settled periods and low pressure systems which the country would normally expect at this time of year. The forecast for the rest of today is for a mixture of bright spells and shows across Britain - a Met Office spokeswoman has said - although some lighter showers are expected in some northern areas of England and parts of Scotland and Northern Ireland. 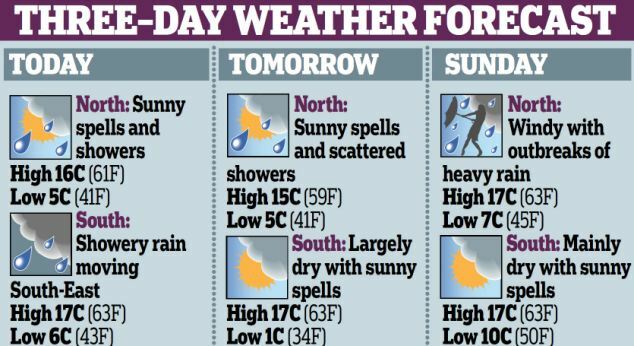 The weather will be fine in many areas with temperatures possibly reaching up to 16C or 18C. Tomorrow is expected to be the best day of the weekend weather-wise with sunshine again expected in many areas. The wind will also be lighter tomorrow making it feel warmer, although there will be one or two showers across north west England and parts of Scotland. On Sunday cloud and rain is expected to return, affecting many areas of Britain, for at least some parts of the day. Heavier rain will fall in north west England and south west Scotland - but southern areas will be mainly dry. However, the wet weather will move southwards in the evening. Temperatures on Sunday could reach up to 19C in London. The weather is forecast to become changeable again into next week, although the Met Office says it will be normal 'Autumnal' conditions. There will be a mixture of sunshine and showers on Monday and Tuesday, although rainy spells will lengthen moving into Wednesday. Flood - YouTube: " "
Doomsday (2012) - YouTube: " "